Rosehill Security, a leading global manufacturer of perimeter security solutions recently announced a product distribution agreement for Denmark and Sweden with Damasec Global Group for the company’s innovative range of hostile vehicle mitigation (HVM) barriers and perimeter security products. To address the growing need to protect crowded spaces and perimeters in light of recent vehicle borne attacks worldwide, Denmark-based Damasec has added Rosehill Security’s range of perimeter security solutions to its product portfolio. Damasec’s exclusive distribution rights will allow the company to distribute Rosehill Security’s products to clients with a wide range of HVM and perimeter security requirements throughout Denmark and Sweden. “While our company’s core purpose is to ensure the safety and protection of people and infrastructure, it is also our aim to become the most trusted supplier of specialist security products and services worldwide. We are pleased to partner with Rosehill Security as an advocate and exclusive distributor of their products, as it will allow us to provide our clients with effective and inventive HVM and perimeter security systems while supplementing our existing product range,” said Henrik Færch, CEO at Damasec Global Group. The agreement extends to Rosehill Security’s full product range, which includes the Impakt Defender and Rapid Defender vehicle security barriers (VSB) and Ballistic Blocks. Manufactured from 100% recycled rubber, bonded with polyurethane for strength, Rosehill Security’s robust Rapid and Impakt Defenders require no foundations and can be installed almost anywhere, removed and reused as required. 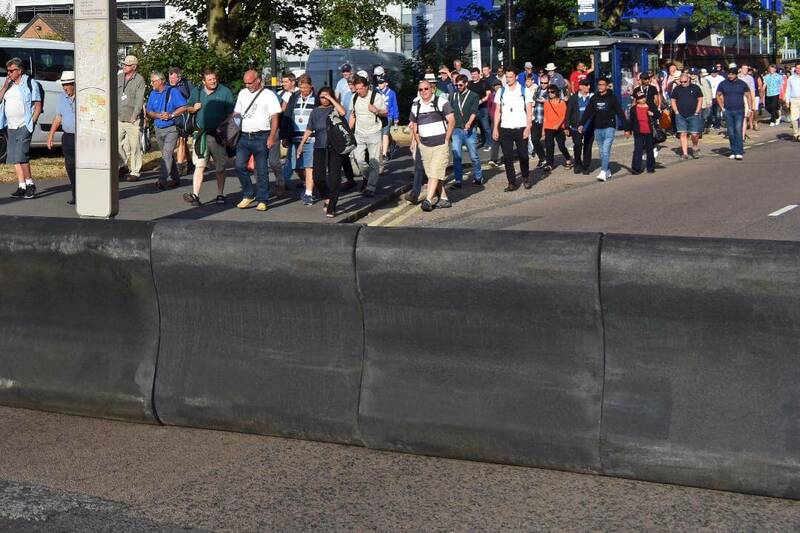 Made up of units weighing 49kg each, the Rapid Defender temporary VSB has been specifically designed to be manually installed in minutes to protect people at events from vehicle as a weapon attacks. Requiring no special tools or lifting equipment, a four man team can manually install a 15m barrier in under five minutes. The much larger, IWA 14-rated Impakt Defender has been designed for temporary, semi-permanent and permanent applications, providing the flexibility to protect both entrance areas and site perimeters against hostile vehicle attack. Each 430kg solid rubber unit is connected by steel securing cables or rods to create a barrier capable of stopping heavy vehicles travelling at 48kph. Engineered using the same manufacturing process, Rosehill Security’s interlocking, T-shape Ballistic Blocks are used to construct temporary or permanent sangars and customised, heavy-duty perimeter structures, providing ballistic protection to BS EN 1522/23. These structures can be combined with the Rapid and Impakt Defenders to create a holistic solution as part of a wider HVM strategy. “Since Rosehill Security’s launch, the company has worked tirelessly to design and manufacture an innovative and effective range of HVM and perimeter security solutions to meet the evolving needs of our clients worldwide. Proactivity in providing protection against vehicle as a weapon attacks continues to be a high priority, so we are delighted to announce Damasec as our partner, ensuring access to a proven range of products for their clients. As specialists in the security industry, Damasec are equally passionate about Rosehill Security’s products and services, so this partnership is an exciting opportunity for both parties,” said Dalton Marshall, Sales Manager at Rosehill Security.